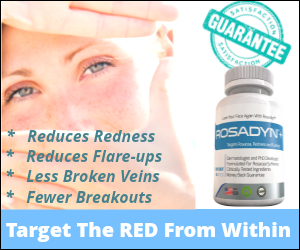 Rosacea News and Information from Around The Web. Rosacea can cause permanent facial damage and emotional trauma if left untreated, but 60% to 70% of people with the condition may never be diagnosed or treated properly, according to a survey undertaken by Galderma Pharmaceuticals. Rosacea, a chronic disease that affects approximately 16 million Americans, is linked to the vascular network of the facial skin and is usually triggered by factors that cause flushing and skin inflammation. General physicians and rosacea sufferers often underestimate the frequency of facial flushing because it is not always visible to the naked eye. A facial flush does not always have to result in a fire-red appearance; in many cases itmay only result in a pinkish-hue, or a ‘healthy glow’. In fact, medical experts point out that facial skin can be completely normal toned (pale color) during flushing episodes. These physicians have found that blood vessel dilation can occur deep within the facial skin, making it hard to detect. More recently, a non-invasive clinical study has verified this phenomenon utilizing laser Doppler flowmetry and reflectance spectroscopy. Drs. Anderson and Maibach demonstrated that lood vessel dilation can occur long before the naked eye can visibly detect it. When it comes to rosacea, terminology such as “blushing” and “flushing” can be confusing and confound treatment. Blushing simply refers to transient facial redness stemming from an embarrassing situation. It usually lasts less than 30 to 60 seconds and after a blushing episode skin tone returns to normal. If blushing is not accompanied by prolonged redness, broken blood vessels, swelling or skin inflammation then the blusher does not have the genetic predisposition for rosacea. In most cases, blushing is well-controlled by prescription beta blockers or bio-feedback treatment. Papulopustular rosacea (Acne Rosacea: Subtype 2). (A) Mild. (B) Moderate. (C) Severe. In a clinical study performed by Dr. Drummond on twenty-one rosacea sufferers and twenty-one non-rosacea sufferers, he demonstrated that mentally challenging arithmetic and “thought” provoking exercises in higher areas of the brain’s decision processing centers induced substantial increases in blood flow in the facial skin of both groups of patients. Laser Doppler Flowmetry was used to measure blood flow in both groups before and after mental exercises. Blood flow and flushing increases were the greatest in the rosacea group and alpha- and beta-receptor blocker medications had no effect on the flushing response indicating that alpha- and/or beta-receptors are not involved in this bsdvi response. This is an intriguing study as many rosacea sufferers report increase flushing during heavy workloads, challenging work and even enjoyable, heavy reading. Follow up studies are required to better elucidate the cause of the flushing response. Celiac disease (also called celiac sprue or gluten intolerant enteropathy) is a condition characterized by a chronic reaction to certain protein chains commonly referred to as glutens, often found in breads and cereal grains. This reaction causes destruction of the villi in the small intestine, resulting in intestinal dysfunction, inflammation, release of inflammatory dilator peptides and malabsorption of nutrients. Symptoms can vary tremendously between patients. Individuals range from having no symptoms to extreme cases where patents present to their physicians with gas, bloating, diarrhea, fatigue and weight loss. It is hypothesized that celiac disease worsens rosacea symptoms by stimulating inflammatory immune cells and/or triggering the release of dilator peptides from the intestinal wall and into the blood stream. Rosacea research has shown that Celiac Disease can cause rosacea flares and cause rosacea to progress due to the chronic inflammatory state and release of potent dilators that can reach the facial skin and cause flushing. It may be comforting to know that identification and avoidance of the glutens (ie gluten-free diet) can result in complete clearance of this disorder and concomitant reductions in rosacea symptoms and flares. 1. Haxthausen, H. “Changes in the skin vessels from protracted action of climatic factors and their significance in various skin diseases”. Br J Dermatol Symp 38-49. 1992. 2. Anderson, P.H. and H. Maibach. “Skin irritation in man: a comparative bioengineering study using improved reflectance spectroscopy”. Contact Dermatitis 33(5): 315-322, 1995. 3. Wilkin, J.K. Rosacea. Pathophysiology and treatment. Arch Dermatol 130: 359-362, 1994.